This piece began life with a Negoro nuri finish and no foot. I pondered it for two years and then decided to elevate it by adding the pedestal and creating a new surface as well. 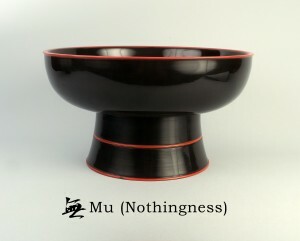 I added the character for Mu, which can translate as nothingness. There is a Zen concept known as Mu-shin, which can loosely translate as No Mind, and is one of the foundational teachings and practices in the Zen arts, both decorative and martial. I tried many times to get the kanji character just as I wanted it in the bottom of the bowl….but to no end. Unsatisfied, I would wipe it out, grit my teeth, and try again. I finally gave up and quit for the day. I opened a beer and sat in the garden for a while. Eventually, I went back to the studio to clean up. On a whim and without thinking about it, I picked up my brush, set it in the bottom of the bowl, spun the bowl by hand, and said, “wheeeeee.” As if by magic, an almost perfect Mu appeared in the bottom of the bowl. This was Mushin in action.